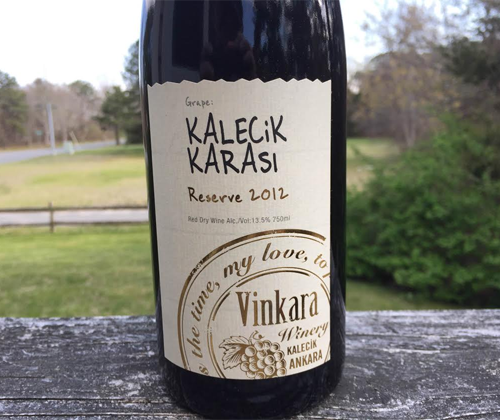 This is the fourth of seven reviews of wines from Vinkara in Turkey. To learn more about the history of Turkish wine, what's going on with it today, and more on Vinkara, check out Tarhun Returns: The Resurgence of Turkish Wine. Kalecik Karasi (Kah-le-djic Kar-ah-ser) has the town of Kalecik, where Vinkara is located, in its name because that is its place of origin, just like the town of Avola is in the name of Nero d'Avola. It was once nearly extinct until it was revived with the rise of fine wine in Turkey and it's now one of, if not the, most famous and in-demand varietals of Turkish wine. It's been mostly compared to Pinot Noir if you want to compare it to something, but it's very much its own thing entirely. I've already reviewed Vinkara's entry level Kalecik Karasi but this is their Kalecik Karasi Reserve. It was cold macerated pre-fermentation, fermented with controlled temperature in stainless steel, then aged for fourteen months in French oak and six months in the bottle. The color is a nearly identical ruby red to the entry level Kalecik Karasi. In that review I said that, even though people say the varietal is mostly compared to Pinot Noir, I felt that it was more like a Grenache than anything. Well this Reserve, just by smell alone, is definitely Pinot Noir-like. In fact, if I was doing this blind I would no doubt guess it was Pinot Noir if I only smelled it. Earthy, sandy, rustic, and toasty with red berries, plum and lilac. I LOVE THIS NOSE! It's fantastic! I can't stop inhaling! It's like cocaaaaaaine! LET'S GET CRANKED WOOOOOO!!! In the mouth it pops right off the bat with acidity and cranberry. This is where it goes from being that rustic Pinot Noir profile to being that stress relieving Grenache profile. It's light to medium bodied, yet still savory and lush, and elegant in balance and character. The alcohol is only 13.5% but you can taste it. Along with the cranberry there's flavors of strawberry and tea. It finishes with strong tannin, alcohol heat, high acidity, and flavors of cranberry and tea. Holy crap. That is a damn fine bottle of wine. Really damn fine! Soooo... would I pay $27 for it? Uh, yeah. Would I suggest somebody drop what they're doing and buy it now with their last $27? Oh hell yeah! This bottle has earned itself a perfect score.